I have a confession to make. I’m a big fan of CRPG games like Bauldur’s Gate, Pillars of Eternity, and Never Winter Nights and all the other games of that ilk — but I’ve never beaten any of them and I’ve probably spent more time reading the instructions, learning about all the various unit stats, and making new parties than the average player. Perhaps it’s just me, but the most fun thing to in these types of CRPG games has been making interesting parties and using them in battles. 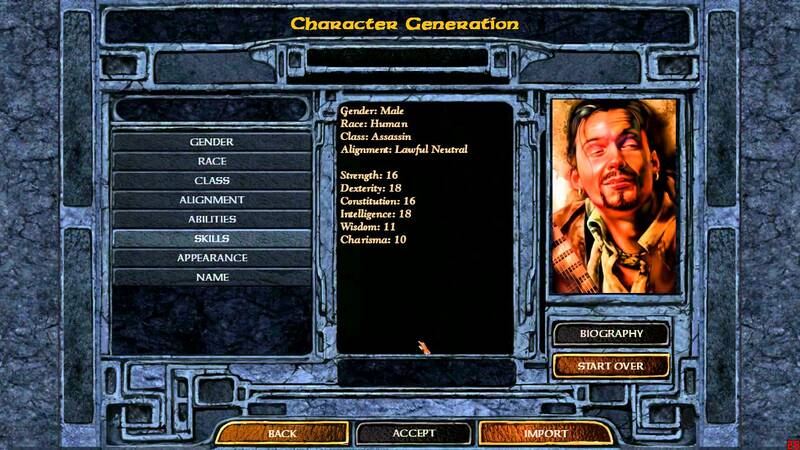 I know many people play these games for their deep diverse story, but for me the thrill was always focused on the fun of creating a character, making him specialize in different skills, and seeing how well he did in battle. This is actually why Grrbls came to be. I wanted a game that let you experience the joy and depth of unit creation and party customization that focused purely on dungeon exploration and battles without story. I actually enjoyed spending a long time in the menus of character creation. I would read all the skills, and plan around making an interesting diverse party. The possibilities of how things could play out always excited me, but the limits of actual game-play during these games was always a let down. That’s not to say these games are bad, far from it, but I’ve always felt the actual use of many of the stats and skills to be a let down. Take charisma for example. This is an interesting stat when you fantasize about it right? You negotiate your way out of a hostile environment, or you sweet talk a vendor into a deal or giving you access to hidden merchandise. But the reality of this stat is usually the opposite of fun. If it let’s you skip a battle, I think that’s generally bad as I like battles. If it gives you access to a special item, the question now becomes: Is the item you are getting better than the raw stat bonus you could have gained by skipping charisma (answer: almost certainly no, and even if it was then the optimal play is to just swap in a real character for battle when the time comes and use that character purely for negotiation). Then there’s also the randomness which is pointless. If charisma only raises your chance of success but you can still succeed without it, you know the player is going to just reload their save file until the dice rolls in their favor. It’s not fun, but my research has told me players will do what’s not fun in order to optimize game-play rewards. Giving players meaningful stats with deep game-play mechanical trade-offs is not easy. But I think by focusing Grrbls on battles, exploration, loot, crafting, collecting and character creation it will be the kind of game I was always looking to play, and hopefully, you will to!